You can't buy happiness, but you can buy face painting....and that's pretty much the same thing. Hi everyone! My name is Kylie and I have been a face painter for over 20 years now. I am based in the Australind/Bunbury area in the South West of Western Australia. I am available to work in; Bunbury, Australind, Collie, Binningup, Capel, Busselton, Eaton, Margaret River and many other area. 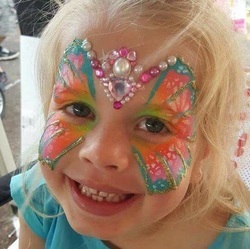 I offer lots of different services such as; face painting, airbrush face painting and tattoos, balloon animals (basic), henna, glitter and bling, bubbles and special effects makeup. I am available for corporate events. Please contact me for pricing. Face Painting isn't just for children, I can provide face and body as well as special effects makeup which is great for fancy dress parties. Adults also love the glitter and bling, and especially love the airbrush tattoos.